With millions of iPads sold, there's no denying that Apple nailed it in terms of size, screen size, interface, battery life and just about everything else. 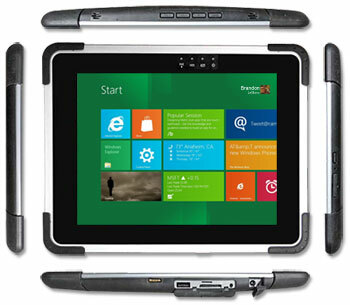 With the M970D-W8 tablet, Winmate clearly acknowledges that. The screen measures the same 9.7 inches as the iPad, and has the same 1024 x 768 XGA resolution as the original iPad and the iPad 2. There's the black bezel and the glass surface. Overall, this tablet seems just what a good number of customers have been waiting for: an iPad size tablet, but tougher and running Windows. But did we cover all the bases? Until the iPhone, almost every smartphone and tablet used either a resistive touch screen or one with some sort of active stylus. Apple changed all that with projected capacitive multi-touch technology that allowed effortless tapping, swiping, pinching and zooming. This poses a problem for devices running Windows (which wasn't designed for capacitive touch) and for anyone wanting to use their device with gloves on or in the rain (capacitive touch can't handle that). There are hybrid solutions that use both capacitive touch and a pen, but Winmate decided to go all the way and offer a pure capacitive touch screen, like the iPad's. In the new world of iPad-class media tablets, size and weight matter. The iPad's 9.7 inch screen size, conventional 4:3 aspect ratio, and roughly pound-and-a-half weight have remained the gold standard. Our Winmate tablet has an iPad size screen, and despite its somewhat larger footprint it mostly feels like a toughened-up iPad. At 1kg it weighs almost a pound more, but somehow it seems to weigh less than that and lighter than other rugged tablet available in the market. One of the principal design elements of the M970D-W8 are the four black bumpers that protect the corners of the tablet. 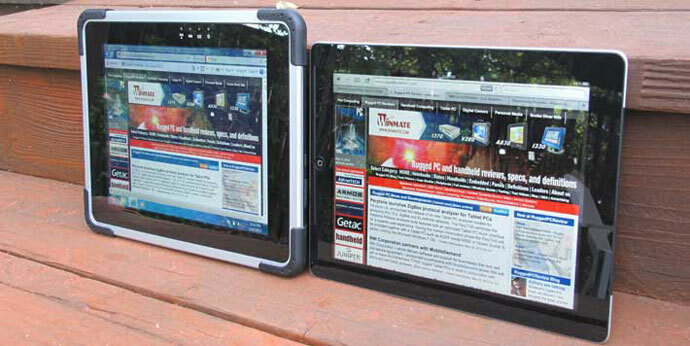 In some tablets, such bumpers are either optional or look like an afterthought, but that's not the case in this tablet. Winmate fully integrated the bumpers into the design while making sure they can easily be replaced. Each bumper consists of two layers, a very tough piece of plastic and then a black rubber layer molded onto it. These bumpers definitely provide good edge protection. They also extend a bit out front, and that adds some protection if the tablet falls on its face. A tablet's display can make or break the product. We expect a bright, vibrant screen these days, one that is rock-solid, displays every detail, and shows deep, rich color. The days where a bit of flickering or color-banding was acceptable are long gone, and color-shifts as you look at the screen from different angles are a definite no-no. To realize just how important displays have become, look no farther than the iPhone and iPad where Apple redefined the rules once again with their "retina" displays. For now, no one has a display like the latest iPad with its incredible 2048 x 1536 quadruple XGA resolution, and you wouldn't expect a rugged tablet to come anywhere close to that latest iPad. Yet, amazingly, Winmate accepted the challenge and came up with a screen that is far, far better than it has any right to be. In fact and everyday use, in most applications it looks every bit as good as the vaunted new iPad that has quadrupled resolution. If that sounds unbelievable, well, take a look at the pictures below. Test pictures from angles to check for reflections or deterioration of display view ability. In this case, M970D-W8 (left side) and iPad (right side) display surfaces reflected, but the picture stayed bright and clear, without any color shifts or aberrations.